Home >> Generated from JAN's SOAR Information System on 4/21/2019 12:08:49 AM. 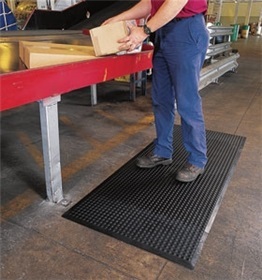 Interlocking Anti-Fatigue Mat has a knobby surface to encourage frequent posture changes, helping to reduce fatigue in the most demanding environments. Interlocking system locks the sections together to create a runner mat of any length and zip apart when needed. Slip-resistant surface encourages frequent posture changes. Thick rubber mat is grease- and oil-resistant with built-in beveled edges for added safety. Black. 1/2" thick.